Went out to lunch, had a Banh Mi sandwich. Best sandwich ever and had to be recreated. A billion banh mi sandwiches on google, damn! Have to come up with something else. 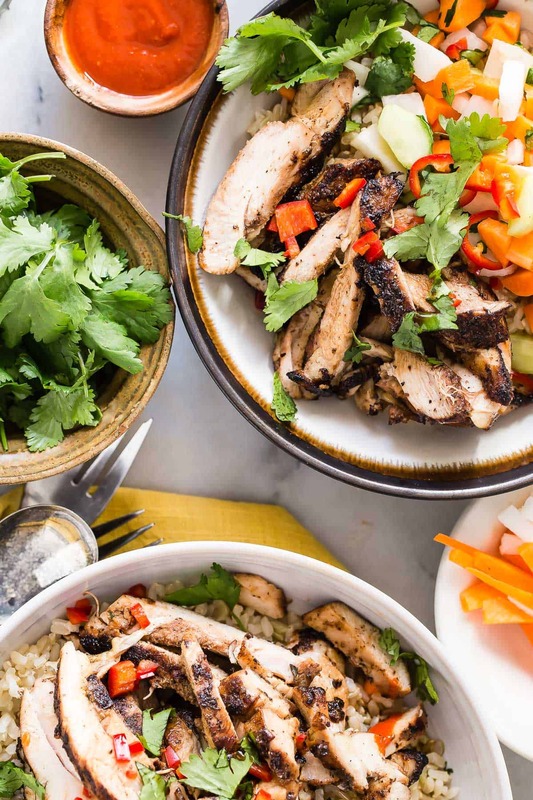 Chicken Rice Bowl disguised as a banh mi sandwich? That was my inspiration for this recipe. The sandwich was off the charts and the only thing I’m missing on mine is the crusty baguette. The chicken is marinated with Chinese five spice which might just be my favorite spice ever. It should be called sensational spice, or crack spice. I’ve always been a strict white chicken meat eater, but that sandwich made me realize just how flavorful the thigh meat is. How come nobody in my family told me this? Now I’ll have to fight my kids for it when I roast a chicken. A key ingredient in a simple banh mi sandwich are the daikon carrots and cucumber. These are pickled and although I took a pickle shortcut, they still worked like a dream. Instead of shredding the veggies I diced them and quickly pickled them in a rice wine vinegar and sugar solution. Save yourself some time and buy frozen brown rice. There’re so many great brands, some organic on the market now, I rarely boil rice anymore. I always screwed it up anyway. Add bunches of fresh cilantro and some sliced red chili for maximum heat. 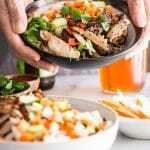 Counteract that spicy heat with an ice cold beer and take a peek at my other bowl meals like Chicken and Bok Choy or Roasted Salmon with Quinoa, Avocado and Apple. Put your phone down, ain’t no need for takeout now. 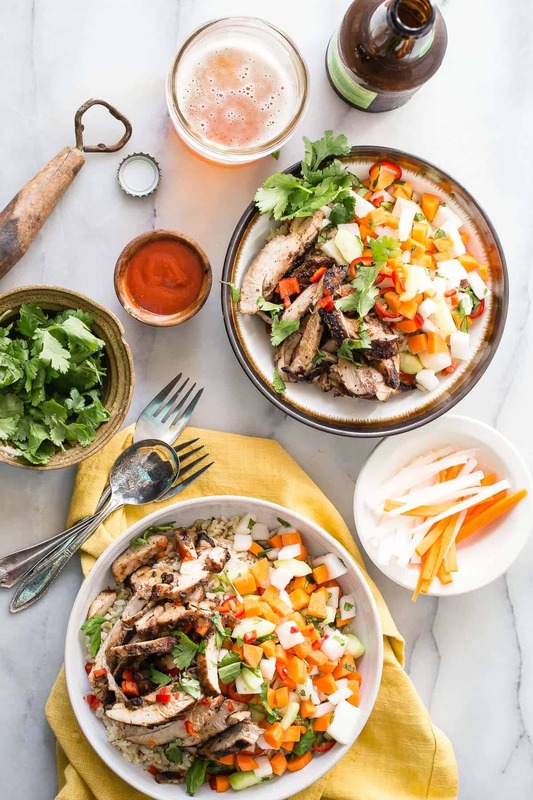 If you love Vietnamese Banh Mi sandwiches, then this version of a chicken banh mi rice bowl will definitely need to be made as soon as possible. In a bowl combine the daikon, carrot, cucumber, cilantro, red chili, vinegar, sugar, and salt. Mix well and let sit for 30 minutes. Preheat the grill to high and cook the chicken until no longer pink in the middle. Cover with foil and let rest for 3-4 minutes. Warm the rice and divide between two bowls. Using a slotted spoon scoop out some of the pickled veggie mix and place on top of the each rice bowl. Roughly slice the chicken and divide between both bowls next to the pickled veggies. Drizzle a small amount of soy sauce over the top of each dish. Garnish with extra chopped cilantro and finely chopped red chili. Serve with Sriracha sauce on the side. Pickled veggies recipe adapted from New York Times Food. Now if only this bowl would magically appear in front of me for lunch…. it’s just what I’m craving! I didn’t know what I was having for dinner. UNTIL RIGHT NOW. These look amazing! Pinned! Thigh meat FTW! 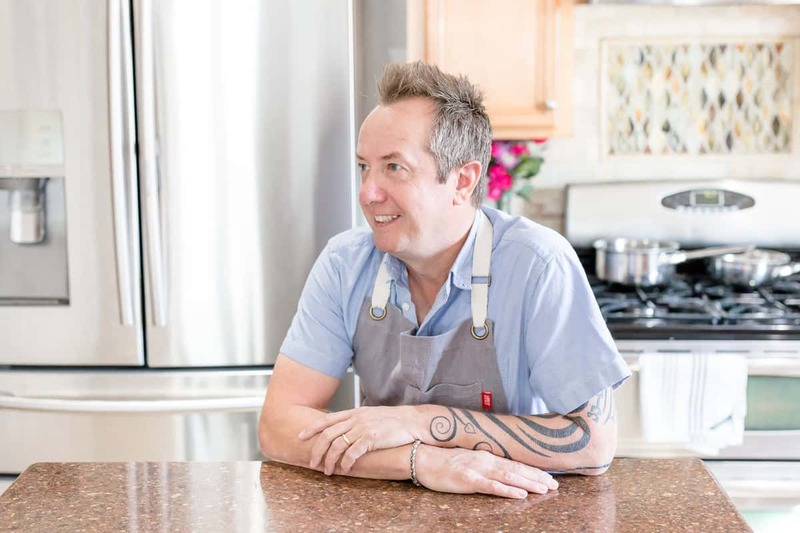 (We were all keeping it a secret so we’d have someone to take all the white meat;). 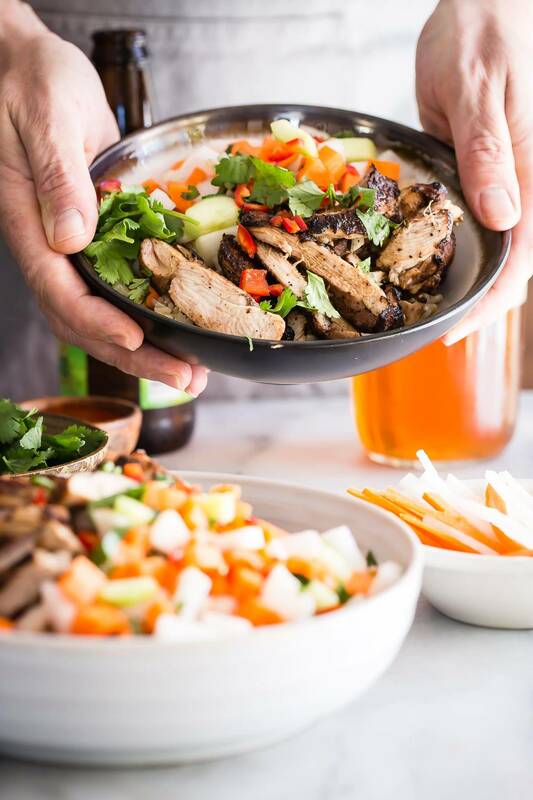 I think this bowl looks even better than a traditional banh mi sandwich! 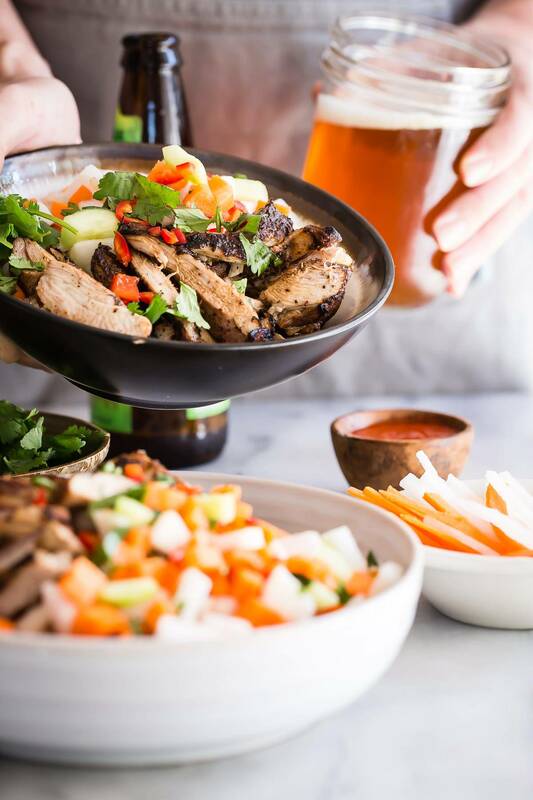 Ooooh, the mister and I have been on a serious bahn mi kick lately, and these bowls look simply divine. Such gorgeous shots! I love a good sandwich – for two reasons, one for the good bread, but really it’s allllll about the filling!! This wins, hands down!! This looks way better than the dinner I had this evening–envy! Oh man. These just got added to my must-make recipe list. Absolutely genius! Love, love, love this!! We’re always craving banh mi sandwiches, and I feel like this is a healthier way to have them more often!